Published: Dec. 6, 2012 at 05:26 p.m. Updated: Dec. 6, 2012 at 08:54 p.m. The housecleaning is coming. And the San Diego Chargers won't go halfway. Kevin Acee of U-T San Diego reported Thursday that general manager A.J. 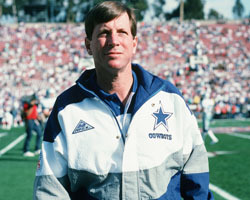 Smith and coach Norv Turner will be fired at the end of the season. Acee's sources said Chargers president Dean Spanos "essentially decided at least a month ago" that Turner would be let go. Spanos also recently decided that Smith will be let go, too. Spanos later released a statement denying the report: "There is only one person in this organization who will make those decisions and that's me, and I haven't shared my thoughts with anyone. I will make my evaluations at the end of the season. Anything coming out now -- from sources or otherwise -- is pure speculation." Similar rumblings occurred late last season, but Spanos changed his mind and kept Turner and Smith. "Those with knowledge of plans that are already in motion said it seems certain there will be no last-minute change of heart this time," Acee wrote. Smith's record as a talent evaluator has taken hits in recent years, especially because of his free-agency mistakes, which included the signings of wide receivers Robert Meachem and Eddie Royal. Smith also failed to keep talented players like wide receiver Vincent Jackson and running back Darren Sproles, who signed with the Tampa Bay Buccaneers and New Orleans Saints, respectively. Smith recently has drafted some good defensive players, like tackle Corey Liuget and linebackers Donald Butler and Melvin Ingram, but the offense has decayed. Still, the succession plan after Smith doesn't inspire confidence. Acee reports that director of player personnel Jimmy Raye is in line to take over for Smith. The owner's son, John Spanos, is expected to eventually take over the Chargers' football operations. If nothing else, this report will be popular among Chargers fans. Even if it's a year too late.